Yesterday at a gathering there was high praise for the new president and very harsh words of sarcastic criticism for George Bush. I dared to disagree. I was considered intolerant because I expressed my disgust with Obama — his socialist agenda, his expanding of the culture of death, and the fact that he is way over his head. I was not a huge Bush fan, though I did like his integrity, honesty and his usual tendency to protect life and practice conservative politics — usually, I said. 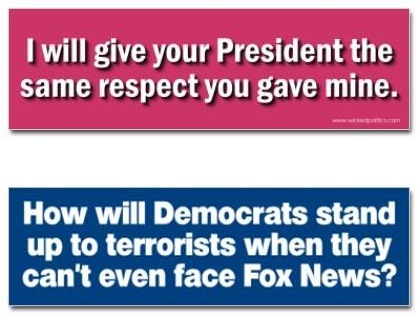 I thought the top bumper sticker was very appropriate after the Democrats excoriated me for my intolerant attitude toward Obama when they raked Bush over the coals. These folks have never been very good at practicing what they preach or showing tolerance and charity while accusing others of what they happily do every day!